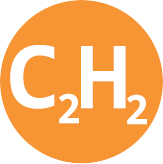 Need compressed acetylene (C2H2) gas? Acetylene provides the hottest flame temperature of all commercially available fuel gases. It is an ideal atmosphere for brazing applications and oxy-fuel welding and cutting. Acetylene provides a precise carbon source needed to create a strong, wear-resistance surface layer on steel parts. Please the table below for information and to access safety data sheets on acetylene available from WestAir.